Paddle in one of the clearest waters in the world!! TOUR GUIDE RESPONSE: Hi My friend! !....Having guests like you makes me to love what I do. Thanks for everything!! Our day with Claudio was the perfect combination of scenery, history and local life. Yet again the benefits of using a local guide bore dividends as we arrived at the museum ahead of the big tour buses, enjoyed a coffee break in an excellent quiet local cafe and arrived back at the ship before the main rush. My wife has mobility problems and Claudio was always at hand to help her whenever he was needed. Altogether a great day with a great guide. TOUR GUIDE RESPONSE: Thanks Geoffrey! TOUR GUIDE RESPONSE: Leslie....I really apreciatte your words....It was a beautyfull day with very nice people!!! In addition to the beautiful Fruitillar, Llanquihue and Puerto Varas, all of those places were beautiful and on our itinerary, Claudio started the day with a short tour of Puerto Montt and showed us a local market. That market was fantastic, the vendors were friendly and eager to show us their produce and ware. We had great fun with the vendors with Claudio serving as translator. Great communicator, very knowledgeable about fauna, flora, history, background, custom. I highly recommend Claudio. TOUR GUIDE RESPONSE: Muchas Gracias Ben! !....Kind regards!! Claudio did an excellent job of introducing us to Puerto Montt and surrounding areas. He took us to a local fish market not generally visited by tourists. He had our entire day planned appropriately, including giving us time to wander on our own. His English was excellent and he was a pleasure to be with. Highly recommend!! TOUR GUIDE RESPONSE: Hi Jo!! Happy to read your nice words. Good to know you enjoyed the Market. I really like that place. BEST WISHES!! Excellent. Smart and shaped up. Flexible. Book him. TOUR GUIDE RESPONSE: Muchas gracias Alan! !...Best wishes!! Claudio was an excellent guide providing much information on the areas we visited plus general info on Chile. A very enjoyable tour which Claudio very much added to our knowledge and pleasure. We spent a lovely day at Puerto Montt with Claudio. He is a great guide. He gave us loads of information and showed us places that we wished to visit but were not in the agreed program. Thank you Claudio and best regards. TOUR GUIDE RESPONSE: Maria; good to have news from you. I always do my best to make my clients happy. Claudio was very good. He was waiting for us at the terminal, his English was perfect, he knows the area and history very well. We recommend him to any one who is visiting this part of Chile. TOUR GUIDE RESPONSE: Loved your words Livia! !....thanks so much for visit this part of the world!! We had a great time with Claudio. He knows a lot about the area, and Chile in general. He is very personable, and it was fun to hang out with him. In addition to the standard stops, like amazing views of lake Llanquihue, Osorno Volcano, and the National Park Vicente Pérez Rosales, he took us to Puerto Varas, which is a very cute town to shop and have a snack. He gave us good recommendations for both! Highly recommended! Thank you, Claudio! TOUR GUIDE RESPONSE: Hi Bev !! I really apreciatte your words. Having Lunch with that nice talk was superb. Best wishes for you!! Our guide Claudio was terrific. A native of the area, Claudio was knowledgeable, courteous and fun. He made every effort to provide the best experience possible and catered to our interests and desires. His suggestions as to shopping and other areas of interest were perfect. We had a very enjoyable day and would highly recommend Claudio and this tour. Claudio was at the pier awaiting our group and greeted us immediately. We had a wonderful tour which lasted the entire day and didn't want it to end but the ship was sailing. Claudio is an excellent driver and that is important to me. His knowledge of the area was great and every landmark was explained in detail. My friend purchased some flowers at the fish market and he leant her the money as she didn't have Chilean money. I hope to book another tour with this company as this guide was superb. TOUR GUIDE RESPONSE: Marianne, thanks so much for come to see us. The idea is to give always the best for our customers/friends. On my behalf I also enjoyed the day with your nice group. Thanks again!! Claudio was great!!! He was very articulate and his English was excellent.He was accommodating and very helpful when both my friend and I both realized that we had left our credit cards and all cash on board the ship. The ship was tendered, so there was the no possibility to return and we were 30 minutes from the harbor. We had no money for lunch or for a tip. He bought the 4 of us lunch and refused to give us his address so that I could mail a check. He's the best!! He was excellent. The four of us all agreed he was most professional and very informative. His English was perfect as our Spanish/Chilean was poor. We much enjoyed his company for the day and would highly recommend him as your guide. TOUR GUIDE RESPONSE: Chris, it was a pleasure to be with your nice group. Best wishes!! Oh Claudio, what a wonderful guide he was! Thanks so much! You made our group trip unforgettable! Claudio was a wonderful tour guide and his knowledge of history and surroundings served to enhance our experience and appreciation of Peurto Montt, Chile very much. There were so much to explore and see. Beautiful Llanquihue lake, snowcapped all year round Osorno Volcano, mixture of colors of the Petrohue river and it's rapid falls...even Puerto Varas was a memorable small town. We highly recommend him!! Claudio was an excellent guide to an area of outstanding beauty. He customized the trip to accommodate the things of interest to us. He shared his knowledge of the area as someone who lives there, not just the Wikipedia facts, but really helped us understand the culture. We were a group of four, each with different interests and all of us had a fascinating day. We have had guides all over the world, he is one of the best. TOUR GUIDE RESPONSE: Hi Carol! !....I really apreciatte your comments....To do tours with people like you makes my job much more easy and funny!! !....Greetings to all of you!! I am super late in writing this review but our trip with Claudio in December 2017 was incredible. We were in Puerto Montt as part of a cruise. There were 6 in our party. Claudio was punctual, flexible and able to connect with everyone in our group ranging from ages 10 to 75. We went to his friends' home and cooked a meal together. What an experience. Each of us had different responsibilities. It was authentic & memorable. Stops we requested on the way included sites, chocolate, wine & a bank. TOUR GUIDE RESPONSE: Hi David! Never is too late. Thanks for visit this part of the world and next time fishing should be better! Regards! What a great day. Claudio was waiting for us at our cruise ship. He is personable and very knowledgeable and speaks very good English. If you can't book him for the day you want his wife is also a guide. There were four of us in our group and we did Petrohue Falls, the Orso Volcano and then had lunch with Claudio at a wonderful restaurant in Puerto Varas, a beautiful little town. His local knowledge made the day perfect. Highly recommend. TOUR GUIDE RESPONSE: Thanks Cathy for your words. It is always nice to share the day with people like you!!! Had a wonderful experience. Guide was great. Claudio had a very easy going pleasant personality and excellent command of English. We never had to ask him to repeat a thing. As opposed to other guides most of who we have been very pleased with, Claudio had a unique way of introducing us to a site or shopping area. He would drive around the shopping/restaurant area pointing out what to concentrate on and recommend, than ask us how much time we wanted to ourselves, and would meet us at an appropriate place. You will not be disappointed. TOUR GUIDE RESPONSE: I feel lucky to have so nice people as my passengers. It was a pleasure! !.....Best wishes James!! Claudio was a really awesome guide. He was really informative and friendly and beyond being an expert in the area, he was just a great person to spend the day with. The tour itself was fantastic. We saw beautiful sights and it exceeded our expectations. TOUR GUIDE RESPONSE: Hi Scott. It is a pleasure to spend the day with people like you. Many thanks for your words and best regards for you 2 !! We had a great day with Claudio visiting some of the main sites around Puerto Montt. He has a thorough knowledge of the area and looked after us really well throughout the day. Highly recommended. Thank you Claudio. TOUR GUIDE RESPONSE: Thanks Kevin for everything!! TOUR GUIDE RESPONSE: Hanne & Soren. Thanks for make my job easier too, being such a nice people. Claudio and his driver, Umberto, were terrific. This was the best excursion on our 16-day cruise. The visit to Petrohue was one of the highlights of our trip. Highly recommended tour and a great guide. TOUR GUIDE RESPONSE: Hi Richard. Thanks for your comment. I had a wonderfull day too with your funny group!! Beto says hello!! Claudio was a great guide and after discussing my desires by email before hand was able to tailor our trip to best suit this. This made the whole experience exceptional and really worth doing. A very personable guide who I would highly recommend. He also recommended a great local restaurant that we would never have found without him. TOUR GUIDE RESPONSE: Hi Ross. It was a great day for me too. Thanks for your visit and say hello to your mother!! There are really not enough words to describe the absolutely perfect day that Claudio arranged for us in Puerto Montt! He is organized, professional and fun! We highly recommend him and were truly sad when our day came to an end! TOUR GUIDE RESPONSE: Hola Martin! !...I'm very glad you enjoyed my services. Best wishes for you 2. Thanks again for visiting the end of the world...Regards!! Excellent tour with a great guide. TOUR GUIDE RESPONSE: Hi Michel!! I also had an excellent day! !...Excellent food and excellent pisco sours too...Thanks for coming!! We had a great day with Claudio. He was very willing to vary the itinerary to suit our interests. He was very knowledgeable and easy going. TOUR GUIDE RESPONSE: Thanks Judy! !...That's the idea of my private tours. I also had a great day with you. Best wishes!! Claudio was punctual and the van comfortable. Enroute he gave us good information about the area and answered questions. My only misgiving was that at the open air German Museum, in Futillar and the walk in the town, he did not accompany us but sent us out on our own. I rely on the local stories and we did not get any of those. Highlight was the outstanding lunch visit where we participated in a demo and cooking with a great host in a beautiful venue. Thanks to Claudio for arranging that. TOUR GUIDE RESPONSE: Many thanks Sondra for your words. All comments and critics are well recieved. There is always something to improve. Regards!! TOUR GUIDE RESPONSE: Hi my friend! !....Good to know you enjoyed my services...Thanks to all of you for your visit!! TOUR GUIDE RESPONSE: Hi Ann, many thanks for your visit...Regards!! Claudio was excellent, as was the tour. 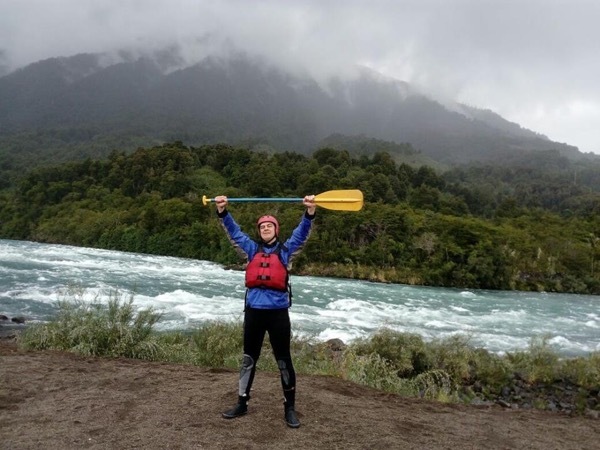 We were originally scheduled to have a different guide, but when a medical emergency arose, he stepped in and gave us a super day at the Falls, the Orsono volcano, and Puerto Varas. His explanations of the things we saw and his enthusiasm and sense of humor throughout made the tour a great success. Claudio did a fantastic job. He was very friendly and personable! He answered all of our questions and made the day wonderful. Would highly recommend Claudio!! TOUR GUIDE RESPONSE: Hi Cathy....It was a lovely day with you and your group....Thanks for everything and best wishes to all of you!! TOUR GUIDE RESPONSE: Hi Barbara! !....Many Thanks for your nice words. It was a lovely day for me too with your company and Mike. Hope you enjoy the rest of your trip in Patagonia!! Claudio was very knowledgeable, accommodating, nice and with a good sense of humor. Also the driver was very cautious and also knowledgeable and well mannered. We enjoyed the tour and recommend him. TOUR GUIDE RESPONSE: Hi Rob. Many thanks for your nice words. Gretings for you and your family!! We had a great day with Claudio visiting Puerto Montt! TOUR GUIDE RESPONSE: I also had a great day Terry!! Claudio was excellent!! We had a wonderful tour that we all enjoyed. He is a knowledgeable guide, who is both very professional and friendly. I couldn't have been more pleased with our day or recommend him any higher!! TOUR GUIDE RESPONSE: Hi DeeDee!! Many Thanks for your comments; it was a lovely day for me too Say hello to your husband and your parents!! Claudio Hope to see you back someday!! Claudio was very attentive to our needs. He was on time, knowledgeable and accessible. We had a wonderful time in Puerto Monte which he made all the more enjoyable. Claudio was excellent he knew his material extremely well and answered all of our questions .. this is the only way to tour when you only have one day certainly far superior to hopping on a large bus with 44 other people .. great experience and look forward to using Tours by Locals in other destinations . Claudio was waiting for us when we arrived at the cruise ship dock, and we instantly felt comfortable with him. He is knowledgeable, relaxed, and good-natured. He's also a good driver! He had planned a day for us that enabled us to see the highlights of Puerto Montt, Puerto Varas, and Frutillar. We had ample free time for strolling, shopping, and taking in the beautiful views. We had an excellent fish and seafood lunch at a restaurant he had chosen. It was a lovely day, and we recommend Claudio highly. Claudio was right there to pick us up after leaving the ship. He is very pleasant and knowledgeable of the area. He tailored the tour to our interests. We stopped by a very good local restaurant and were able to try local seafood that we have not had before. Excellent tour. Thanks. Claudio was excellent--solicitous, interesting, fun and informative. So nice to go on a tour like this with individual attention and someone to answer all your questions. We had a much better experience than all the bus tours. We got to go to a delightful restaurant and go up to Osorno and climb part way up the mountainstide. I would rate Claudio very highly for his English skills and interpersonal skills in helping us have a wonderful time in the beautiful area of Puerto Montt and environs. Thanks! Claudio was a terrific Guide for our Sun Tours Hawaii group of 33 for Puerto Montt. Everything pre-planned was excellent! Private bus and driver also excellent. So very tall, you cannot miss him. His knowledge of the area and what to do were outstanding. I am looking forward to organizing another tour with Claudio and returning to beautiful Puerto Montt! TOUR GUIDE RESPONSE: Hi Nancy!! Many thanks for your words. Is good to know you had great time on your tour here. That´s the idea!! On my behalf i really enjoyed the day with you and your group. Best regards and hope to see you back !!! Claudio S.